A dietary supplement which fortifies and vitalizes the whole body. 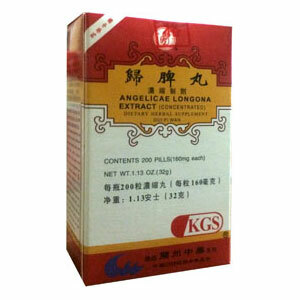 The special formula promotes blood circulation through all the internal organs. Used to treat Deficient Heart/Spleen Syndrome due to over-thinking. Insomnia, poor memory, nightmares, palpitations, restlessness, agitation, dizziness, Deficient type of headache, fatigue, pale face, poor appetite, neurasthenia. Gynecological problems such as irregular menstrual cycle due to Deficient Blood, hypermenorrhea with light red blood due to Deficient Spleen, and leukorrhea due to Deficient Spleen. Chronic bleeding which may be associated with gastric ulcer, functional uterine bleeding, bleeding due to thrombocytopenia, aplastic anemia.